It was all eyes on Tiger, and he delivered a promising performance in his first round back since his fourth back surgery. Tiger made five birdies and two bogeys en route to his 3-under 69 and a tie for 8th in the 18 player field. Tiger was impressive with his driver and showed no ill effects from his latest back surgery. His swings were aggressive but under control, and he avoided the two-way miss. His ball speed was nearing 180 mph, a number reserved for the longest players on Tour. He regularly outdrove playing partner Justin Thomas, who ranked in the top 10 in driving distance in 2016-2017. Tiger only hit one poor tee shot, which resulted in an unplayable lie and one of his bogeys. Tiger is arguably the greatest putter and iron player of all time, and those skills are still there. It took Tiger only 27 putts to get around Albany, canning a few putts over 20'. Despite a windy day, his distance control with his irons was on point. I always look at par-3 performance as a good barometer of ball-striking, and Tiger played the five tough Albany par 3's one-under, on a gusty day. Where Tiger struggled is with his wedges. He hit many below-average approach shots from inside 100 yards and struggled around the greens. This is understandable given his 300+ day layoff from competitive golf. I expect the wedge play and short game touch to improve each day at the Hero and with each event of the season. Par 5 scoring is usually a good barometer of how sharp a player’s wedge and short game are; Tiger played the five benign par 5's one-over, second worst in the field. After one round, Tiger is in the thick of the tournament. He will need two very good rounds on Friday and Saturday to have a chance on Sunday. If he continues to hit it and putt it like he did Thursday, he will have a chance (especially if his wedge play improves). After winning the European Tour's season-long Race to Dubai, 26-year-old Tommy Fleetwood is looking for his 3rd win of 2017. The Englishman will have reason to celebrate regardless next week as he is getting married at Albany on Tuesday. I spent a couple of days this week in Dallas at Trinity Forest Golf Club. Trinity Forest is the new host of the PGA Tour's AT&T Byron Nelson Championship. The Coore & Crenshaw design opened in 2014 and is built on a old landfill. This is a splendid course that offers a vastly different venue than your typical PGA Tour course. It's designed to play firm and fast and places an emphasis on the ground game, shotmaking and strategy. There are quite a few fantastic golf holes, which I will continue to highlight in the coming months. Unlike many PGA Tour stops, Trinity Forest puts an emphasis on approach angles and positioning. Trinity Forest will be at its best if the course is firm and fast. This conditioning will make the course play far shorter than the yardage but force players to think about where they are landing their shots on approaches. The par 4 6th hole is a great example of what Coore & Crenshaw usually set out to achieve in their designs. Off the tee, the left side of the fairway is the ideal angle of attack. However, this left side is guarded by three bunkers. C&C used centerline bunkering, not once but twice, to stimulate indecision and thought off the tee. The first of the two centerline bunkers sits on the left portion of the 70-yard wide fairway, 279 yards from the back tee. Just left of it, 284 yards from the tee, is the left fairway bunker. Together, these bunkers force players to thread a driver in a 20-yard wide window in order to gain the ideal angle of attack and a wedge approach. Longer hitters who can carry the first bunker have to deal with a narrowing fairway and a second fairway bunker at 327 yards. This bunkering leaves players with three options. Option A: Thread a driver through the narrow gap on the left to gain the advantage of a short wedge from a perfect angle. Option B: Layup short of of the centerline bunker which leaves a short to mid iron into the green, depending on the wind. Option C: Hit the ball right of the centerline bunker, gaining the advantage of a wedge but losing the ideal angle. The green complex shows the importance of the angle of approach. The green is shallow, wide, has an intimidating false front and several subtle humps and bumps throughout. A large spine bisects the green into a right and left half. The right side of the green is larger and has a few knobs that may deflect shots away into one of the two back bunkers. Approaching from the left side of the fairway provides a far better angle of attack than the right. The left half is smaller and has a little bit of a bowl effect which can be taken advantage of from the left side of the fairway. The unprotected opening to the green allows the approach shot to be flown or run up. A conventional aerial shot is difficult when the hole plays downwind. The large false front has a downslope on the backside. In firm conditions with a helping wind, any shot that lands on the backside of the front are dead. No chance to hold the green. Any approach from the left also has to be perfect. From that side, players have to deal with the center spine and false front, giving an area the size of a bath towel to land it and hold the green. The pros rarely use the ground game at most Tour setups. They may have to here. The ground shot offers a more equitable shot option to players. The false front presents the biggest challenge, but the green contours on the left side can help funnel shots towards the pin. It will be interesting to watch how the world's best players strategize and tackle the 6th. I expect the decision off the tee to be dictated by the wind. When it's downwind, play will be more aggressive to attempt to get a spinning wedge in hand. When it’s into the wind, players will lay back and use the wind to stop an aerial shot. With simple fairway bunkering and an interesting green complex, Trinity Forest's modest 420-yard par-4 6th is quite the test. I also put together a truncated video version of this On the Skillet. Check it out on our YouTube page and please subscribe. 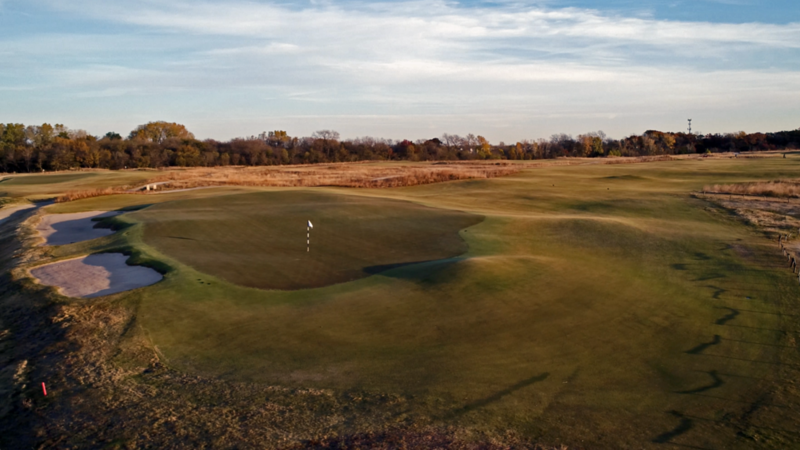 Watch the the drone video of Trinity Forest's 6th hole. If you missed it, be sure to check out our podcast with Paul Goydos, it was a fascinating discussion about a variety of golf topics. Through two rounds Marc Leishman leads the Australian PGA Championship.